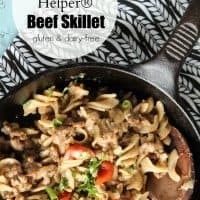 This Healthy Hamburger Helper Beef Skillet is a one pan meal that is so easy to make and satisfying. 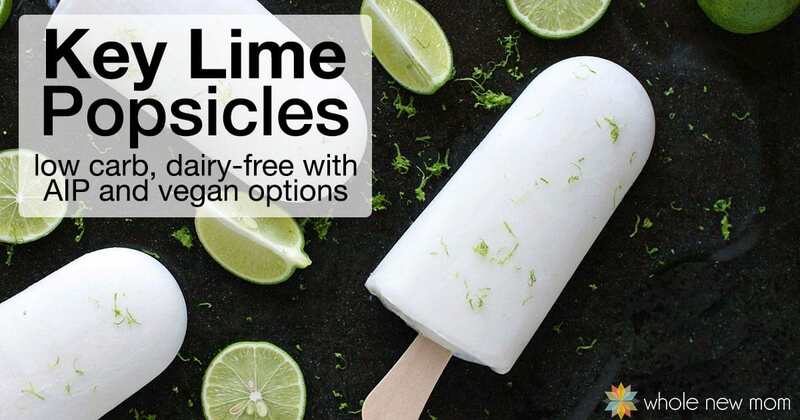 It's dairy-free & gluten-free and is a much healthier alternative to the popular boxed mixes. As a mom, I absolutely ADORE one pot (or skillet) meals! 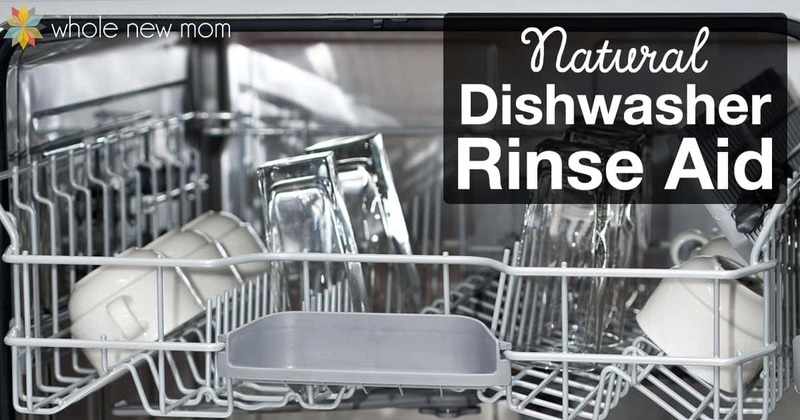 They are convenient and super easy to clean up. As a child, I loved all the variations of Hamburger Helper …but if you examine the label, truly the frightening ingredient list means that even withOUT allergies, I would not choose to feed the contents of those boxes to my family. Seriously–just look at this ingredient list in Hamburger Helper's Beef Pasta “meal”!! I'm not wanting things like monoglycerides, hydrolyzed corn protein, GMO canola and soybean oil in my dinner! However, the convenience is oh so tempting. I mean–dinner in a flash? I need that so much of the time. So the question is–how to make this a REAL FOOD meal? 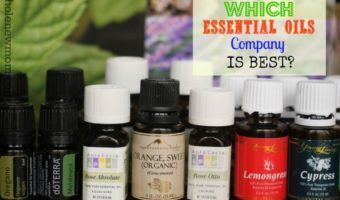 Answer–it can be done and here's how. Come with me, and I will show you an easy way to make every kiddo happy with a yummy dinner that is also healthy. 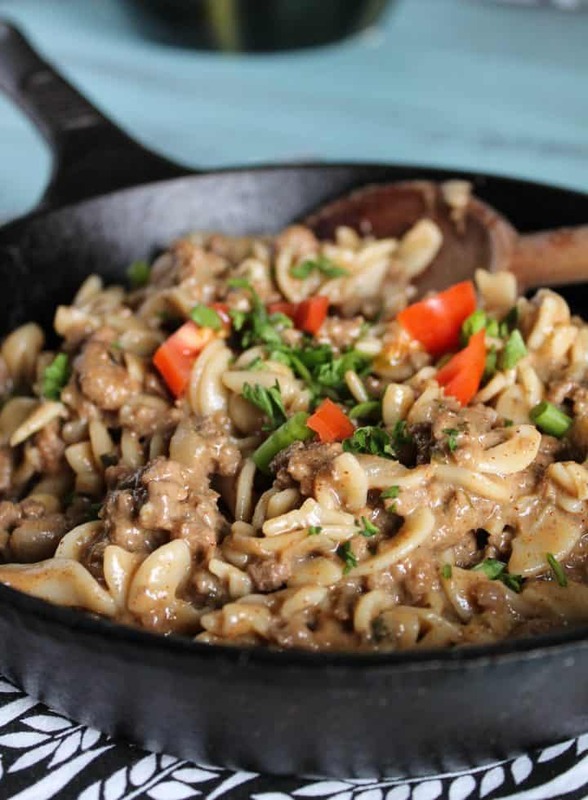 Instead of the packets of who knows what in an overpriced box in the store, you can pull together whole food ingredients from your kitchen to easily make up this homemade hamburger helper that is super nutritious and fits almost any special diet. You can even use grain-free noodles or spiralized noodles to make this a grain-free, low carb meal. 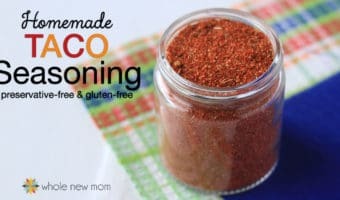 So save money and keep your family healthy with this fabulous option for an easy meal that's sure to please both kids and adults alike. Or try some of my other super fast meals that I shared here on Whole New Mom awhile ago. Noodles: For noodles, I use Trader Joe's Brown Rice Spirals or Tinkyada. 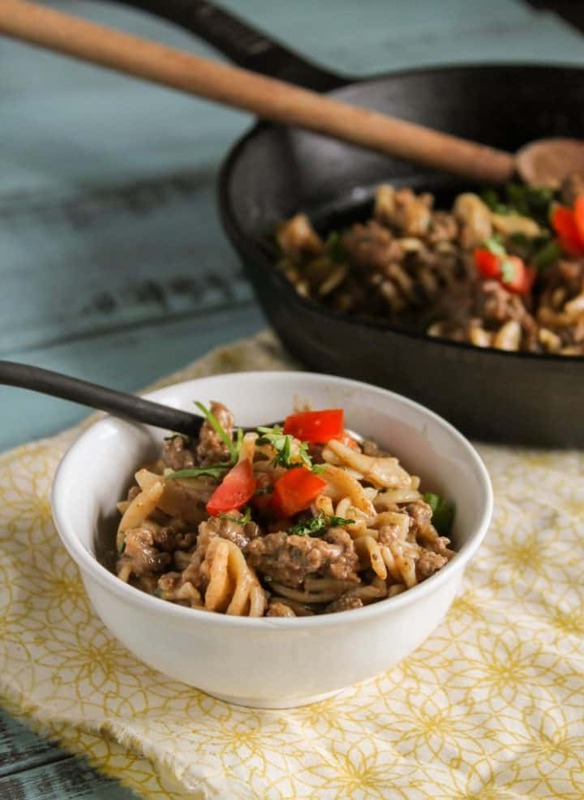 For a low-carb option, either omit or use “zoodles” or “Miracle Noodles.” This also makes this hamburger helper keto and Paleo approved, and makes it an “S” on the Trim Healthy Mama plan. Otherwise, this is a THM crossover. 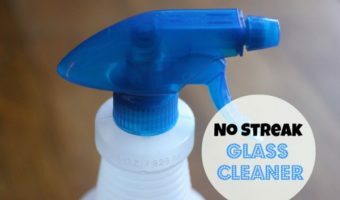 If you use either no noodles or use “Miracle Noodles,” the liquids will need to be reduced as there are no dry noodles to absorb the liquid. Cook the remaining ingredients separate from the noodles, reducing the liquid to 1/2 cup EACH milk and beef broth. Then use 1 Tbsp tapioca starch mixed with 2 Tbsp water mixed into the simmering mix to thicken. Serve atop low-carb noodles or “zoodles,” or sauteed veggies. Milk: Coconut and almond are my favorite options for milk. Here are Easiest Homemade Coconut Milk, Easy Homemade Almond Milk, and Homemade Rice Milk. 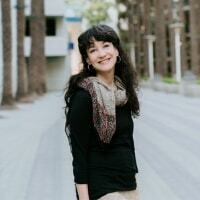 Broth: I use my own homemade beef bone broth for added nutrition benefits. See How to Make Bone Broth. You can also buy it here, or get that same brand on Amazon. 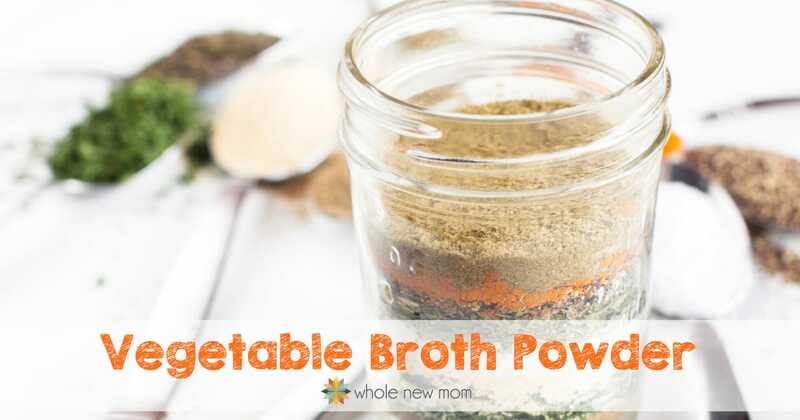 If you are in a pinch, use this Homemade Vegetable Broth. Cheddar: For an allowed cheddar, I used Daiya Cheddar Shreds. 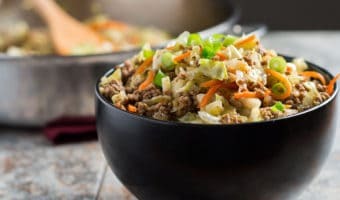 THM: For those on the Trim Healthy Mama plan, use a low-carb option for the noodles to make this recipe qualify as an “S.” Otherwise it will be a crossover. One-pot meals are super convenient and easy to make, but not always healthy – except this one is! 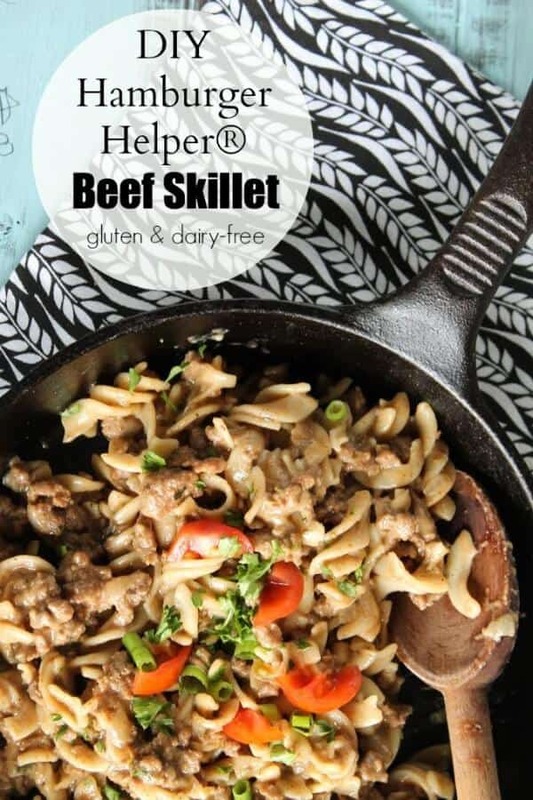 This healthy Gluten-free Hamburger Helper is also dairy-free, full of real-food ingredients with a taste kids love! Preheat a 10-in. skillet with a tight fitting lid over medium heat. Add in your ground beef and diced onion, brown. Add in all the spices. Stir in the liquids and noodles. Bring to a gentle simmer, cover, and turn the heat to low. Simmer about 10-15 minutes until the noodles are tender and most of the liquid has been absorbed. Remove from the heat, vent the lid, and let rest to absorb the remaining liquid for about 5 minutes. Stir in the cheese and Worcestershire, taste, add more salt if necessary, enjoy! What's your favorite “ready in a flash” meal? My son has such digestive problems and there are many foods he cannot eat. I made some minor adjustments, such as just using butternut squash (it’s all I had), no tomatoes, onions or chili poweder, used ground turkey and this turned out great! My whole family will eat it! Thank you for this simple recipe. I also froze about 4 more dinners so I can pull them out when needed. Yeay! Made this tonight and it was such a perfect weeknight meal. Both my kids loved it (5 and 2) and my husband asked for thirds. Thanks! Thanks Adrienne. I’m making it now as is….sauce is VERY YUMMY. Perfect seasoning. 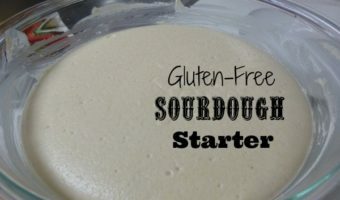 I’ll try adding cauliflower for the next batch. Will definitely make this again! Has anyone tried replacing the noodles with cauliflower? No but sounds like a great option to me! We love this meal! Do you think if I doubled the recipe, that it would freeze/thaw well? Have you ever tried it? With a third baby coming soon I am trying to find some GF/DF recipes to freeze ahead of time!